Eagle Ghost with the symbolic fall of the tribes in "end of the trail". This is a large sand painting by the famous Navajo Indian Michael Watchman of New Mexico. Used by the Medicine Man of the tribe to treat the sick. It is artistically triple matted in a walnut wood frame.Large 20" X 20 inches. Shipping is free. Beautiful traditional sand painting by Navajo artist Wilton Lee of New Mexico. Sand paintings are used by the Medicine Man of the tribe to treat the sick. The large sand painting is artistically triple matted in a walnut wood frame. Shipping is free. This is a large sand painting by the famous Navajo Indian Michael Watchman of New Mexico. Sand paintings have been used by the Medicine Man of the tribe to treat the sick. The sick person would sit on top of the sand painting so the healing spirits would come through the painting and heal the sick person. This sand painting is artistically triple matted in a natural light walnut wood frame. 20" X 20" Shipping is free. This sand painting by Glen Nez of the Navajo tribe is framed in a walnut frame with triple matting. The Navajo artist used naturally occurring colored rock that are crushed into sand. Each color symbolizes a time of day and direction. Blue sand symbolizes South in the middle of the day, while white sand is the East at dawn. Black represents North during the night and yellow sand symbolizes West in the evening. Large 20" X 20" and shipping is free. Glen Nez, who belongs to the Navajo Tribe, created and signed this beautiful, framed sand painting. 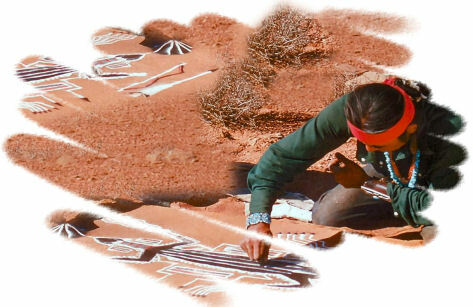 He has been a talented sand painter using traditional themes as well as ceremonial content. He is from the Navajo Reservation in Shiprock, New Mexico. A card with the artist's photo is included. It is 14" X 14" and shipping is free. Michael Watchman of the Navajo Tribe, created and signed this beautiful, framed sand painting. He belongs to a family of famous sand painters of the Navajo Reservation in Shiprock, New Mexico. A card with the artist's photo is included. It is 14" X 14" and shipping is free.